If there was a turning point in the public’s perception of the Whitechapel Murderer it came in the aftermath of the 30th September 1888. It was in the early hours of that morning that the murderer, after an absence of three weeks, killed twice in a little under an hour. At 1am the body of Elizabeth Stride was discovered in Dutfield’s Yard, off Berner Street. Her murderer had then headed in to the City of London where he murdered Catherine Eddowes in Mitre Square, just inside the City’s eastern border. The City of London has its own police force, the City Police, and the murder of Catherine Eddowes now meant that a second force became involved in the hunt for the killer. Yet the murderer’s actions in the early hours of the 30th September did, in the eyes of many, succeed in exposing the shortcomings of both forces, whilst also illustrating the reckless cunning – or the incredible luck – possessed by the perpetrator of the crimes. Having murdered Catherine Eddowes on City Police territory, he had slipped back into the East End and had disappeared into the very streets where the Metropolitan Police were trying to track him down after the earlier murder of Elizabeth Stride. As dawn broke on the 30th September 1888 the “Red Fiend,” as some newspapers were dubbing the killer, had succeeded in humiliating two police forces and had left the senior offices of both looking totally bemused and seemingly ineffectual. And, in the days that followed, some of those officers would make an error of judgement that would result in the police investigation coming close to meltdown. In the aftermath of the murders of Elizabeth Stride and Catherine Eddowes public attitudes towards both the police and the crimes began to change dramatically. The fact that two women had been brutally slain within an hour of each other, apparently by the same man, and only a short distance apart, ensured that fascination with, and fear of, the murderer was raised to a whole new level. As word of a ‘double event’ crackled around the metropolis excited and agitated crowds flocked to the murder sites to speculate on the killer’s motives and identity. Berner Street was described as being like a sea of heads from end to end, whilst the thoroughfares around Mitre Square were blocked by ghoulish spectators. The murders were rapidly assuming a distinct air of melodrama, and on the 1st of October the actions of the Metropolitan Police ensured that the gruesome street pantomime was given a suitable villain to ensure that it would run and run. I keep on hearing the police have caught me but they wont fix me just yet. I have laughed when they look so clever and talk about being on the right track. That joke about Leather Apron gave me real fits. I am down on whores and I shant quit ripping them till I do get buckled. Grand work the last job was. I gave the lady no time to squeal. How can they catch me now. I love my work and want to start again. You will soon hear of me with my funny little games. I saved some of the proper red stuff in a ginger beer bottle over the last job to write with but it went thick like glue and I cant use it. Red ink is fit enough I hope ha ha. The next job I do I shall clip the ladys ears off and send to the police officers just for jolly wouldn’t you. Keep this letter back till I do a bit more work, then give it out straight. My knife’s so nice and sharp I want to get to work right away if I get a chance. Good Luck. At first the police were convinced that the letter was a hoax. But within twenty four hours of its being forwarded to them the ‘double event’ occurred, and left them with little choice but to begin taking an interest in what ‘Jack the Ripper’ had to say. The comment that “…I want to get to work right away if I get a chance…” appeared to give credence to the author’s claim to be the murderer; whilst his threat to “clip the ladys ears off and send to the police officers,” when weighed against the fact that her killer had indeed mutilated Catharine Eddowes’s earlobes, was now, so the police thought, far too prophetic to dismiss as an empty boast. Furthermore, their investigation was rapidly losing both momentum and direction, and they were in desperate need of a breakthrough. Perhaps the “Dear Boss” missive could provide it? So, on the 1st October, the letter and its contents were made public, and from that moment on five sordid East End murders were guaranteed a gruesome immortality, whilst the homicidal miscreant responsible for them would be elevated into the realm of legend. In the early post on Monday 1st of October, a postcard written in a similar handwriting as the ‘Dear Boss’ letter, was delivered to the Central News Agency. I was not codding dear old Boss when I gave you the tip, you’ll hear about Saucy Jacky’s work tomorrow double event this time number one squealed a bit couldn’t finish straight off. had not the time to get ears for police. thanks for keeping last letter back till I got to work again. The inference of the postcard, of course, was that it had been written within hours of the murders, and that the author was informing the police of the two murders he had just committed. Furthermore it boasted that he had indeed attempted to make good on his promise to ‘clip the ears’ off a victim. Whether or not the police believed it to come from the murderer was largely immaterial, the correspondence had to be investigated and, if possible, their author traced. So both the card and the ‘Dear Boss’ letter were reproduced on posters, which were placed outside police stations with a request for anyone recognizing the handwriting to contact the police. By the 4th October facsimiles of the letter and postcard had been released to the press and were beginning to appear in newspapers all over the world. “I will only add here that the “Jack the Ripper” letter which is preserved in the Police Museum at New Scotland Yard is the creation of an enterprising London Journalist. Indeed the fact that the sender had demonstrated the wherewithal to send his communication to a news agency, as opposed to a local or national newspaper, suggests that he did indeed have an in depth knowledge of how the press worked. Littlechild’s memory was slightly amiss when he wrote to Sims, since Tom Bullen was in fact Thomas J. Bulling. But, interestingly, he only sent a handwritten copy of the original. Perhaps he was finding it difficult to disguise his hand writing? I must get to work tomorrow treble event this time yes yes three must be ripped . will send you a bit of face by post I promise this dear old Boss. The police now reckon my work a practical joke well well Jacky’s a very practical joker ha ha Keep this back till three are wiped out and you can show the cold meat. Obviously, whether it was Bulling or Moore, or for that matter whether it was either, who was responsible for inventing the name Jack the Ripper will now never be known for sure. What is interesting about this third letter, however, is that by 5th October the police were evidently dubious about the provenance of the correspondence, and were beginning to realize that releasing them had hindered rather than helped their investigation. Indeed it seems likely that they asked the Central News Agency not to release details of it, and as a result it received hardly any mention by the newspapers. 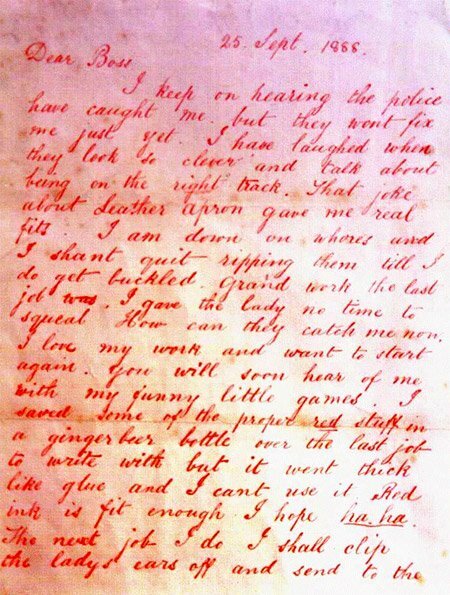 Given the huge number of prank letters that almost overwhelmed the police investigation in the wake of the original Jack the Ripper missive, it is surprising to note that only a small number of those responsible were apprehended, and only two of those authors were actually imprisoned by the authorities. If the Bradford Police would like to make another gallant capture now is the time. I have arrived in town for the purpose of doing a little business. Bradford is the field that requires my labour. Of course knowing as I do that your men are so clevah it is not necessary to give my address not yet describe myself minutely. I will simply state that I am here and alone quite near the Town Hall. I am, my dear sir, yours in the fight against wickedness. J. Ripper. P.S. – Perhaps you would like my portrait, but you see I am in deep mourning for those ladies that I put to sleep, and do not wish to have one taken. Those enquiries eventually led them to Maria Coroner’s lodgings where they found “some letter-paper of the kind upon which the letter was written.” Detective Inspector Dobson and Detective Sergeant Abbey then went to the shop where Maria worked and, on searching her boxes, found a copy of the letter that had been sent to the Chief Constable in the same handwriting. Taken back to her lodgings Maria at first denied any involvement. But, having considered her situation, she finally admitted her guilt and produced from her pocket “more literature of the same kind.” Her landlady commented that the girl had become so excited by reports of the Whitechapel Murders that she (the landlady) was afraid to go to bed at night. In court Maria Coroner excused her “foolish conduct” by saying that she “had done it as a joke”. Before Sunday night I mean to have your life. I shall be upon you without your thinking. I will play a better trick with you than I did with the last one, and that was clever. Elizabeth Magor told the court that Mrs Howells was a neighbour but that there was “never anything between them.” She also told how when she received the letter she had been greatly alarmed and had duly handed it over to the police. Her husband meanwhile had been extremely annoyed and had demanded an apology from a repentant Mrs Howells, who complied with a written apology and a guinea compensation. Evidently Miriam Howells must have been a joy to have as a neighbour! Mrs Howells was then dismissed. 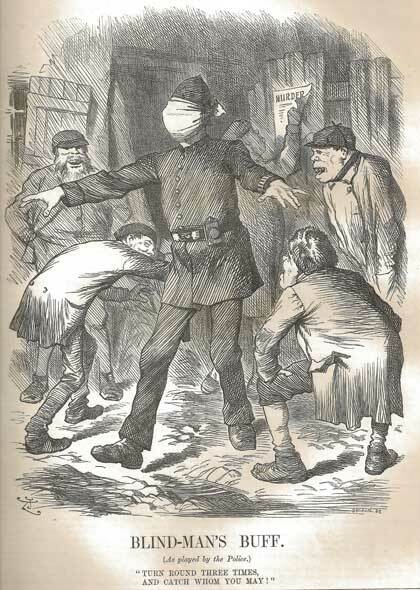 The Charlotte Higgins case is of interest in that she has not been particularly well documented and yet provides us with an insight into how seriously police forces throughout the country were taking these fictional threats from the “Whitechapel Murderer” by the end of 1888. Charlotte was a domestic servant in the household of the Rev. Samuel and Mrs Harvey of Holmdene, St. Marychurch. The first witness to give evidence was Police Sergeant Bright who told the court that on the evening of the 12th December the Reverend S. Harvey had visited him and had handed over two letters which he and his wife and received. 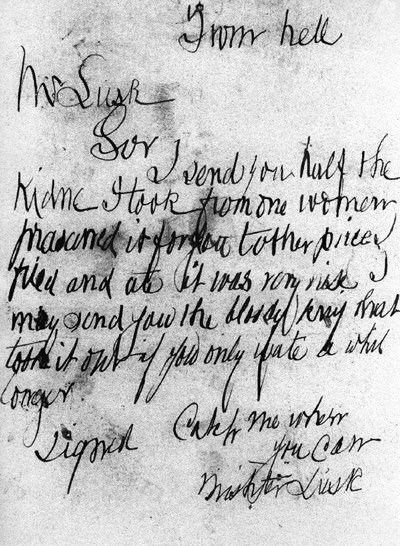 One of the letters threatened, “My God I’ll cut you up from head to foot; I’m the Whitechapel Murderer.” This, and other threats contained in the missives (the majority of the text was not made public as the magistrates considered the language “too disgusting” for public consumption) had evidently unnerved the Reverend Harvey and he asked for immediate police protection. The police certainly took the threats seriously and the household were given an overnight police guard. The following day Bright went round to the Harvey house and went to see Charlotte Higgins in the kitchen. She took him to the back door and “showed him a place where she said a man had come over a wall at about half-past six o’clock on the same morning.” She claimed that the man had knocked on the door and when she asked him who he was he replied “Open the door or by God I will murder you.” She was so terrified by this, she told Bright, that she ran to her mistress’s room. That night Mrs. Harvey arranged for the gardener to sleep in the house. Bright went home and returned the following morning whereupon Mrs. Harvey handed him two further letters she had received. At this point Bright appears to have grown suspicious of Charlotte Higgins, and he went to the kitchen to ask her if she possessed any writing materials. She said that she did and took him to a draw in which he found writing materials and a scrap book which Higgins confessed were hers. The police man then confronted her and accused her of sending threatening letters to her Mistress. Marching her to the wall over which she claimed the man had climbed he pointed to a pile of fresh earth and told her it most certainly had not been dislodged by someone climbing over the wall. At this point Higgins confessed that she had brought the earth from elsewhere in the garden and admitted that she had invented the man. Police-sergeant Bright duly took her to Mrs. Harvey and in front of her mistress he charged Charlotte Higgins with sending threatening letters. The girl admitted her guilt and begged Mrs Harvey to forgive her. The ministers wife was evidently not about to forgive and forget and told the girl that “the offence was of too serious a nature to allow of that being done.” Charlotte was escorted to the police station where, on searching her clothing, Bright found an envelope similar to that which had contained one of the letters. This concluded the evidence of police-sergeant Bright. Two days later at about 4.30pm, on the afternoon of Wednesday 12th December, Mrs. Harvey had been writing in her dining room when Charlotte Higgins had brought her a letter which she said had been posted through the letter box. According to the Torquay Times and South Devon Advertiser, “The contents of the letter were of such a frightful character that it made the witness’s hair stand on end and she had made up her mind that she could stop no longer in the neighbourhood.” She showed the letter to her husband and he promptly went to the police who placed an overnight guard on the house. Mrs. Harvey then told the court that she had since learnt that the different letters were written by the prisoner but expressed mystification at her motives. She had not reprimanded the girl and she was fulsome in her praise of Charlotte’s character and work record. It was also revealed to the court that whilst searching for writing and writing material police-sergeant Bright had found a sealed packet in the prisoner’s room and on opening it he found some letters and a large doll. Around the body of the doll were wound two pieces of ribbon (value 1s) which the prisoner claimed were hers. However, it transpired that the material belonged to Mr and Mrs Harvey’s daughter who said that she had never given the ribbon to the accused. As a result Charlotte Higgins was also charged with theft. Their actions serve to illustrate the mass appeal that the reporting of the Jack the Ripper murders was generating throughout the country at large, and there can be little doubt that many of the sickest and most perverted sentiments expressed in some of the other Jack the Ripper correspondence were written by similarly ‘respectable’ Victorian citizens who found the allure and titillation offered by the press reportage of the murders irresistible. 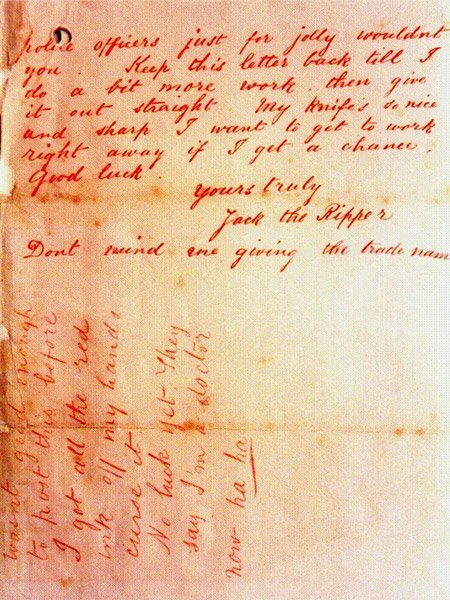 But the harshness of the treatment meted out by the authorities (particularly in the case of Charlotte Higgins whose sentence for theft was evidently influenced by her letter writing activities) illustrates just how seriously the powers that were took the avalanche of Jack the Ripper correspondence and shows their determination to make examples of those that they were able to trace in the hope of discouraging and curbing an activity that had become a disturbing and distracting national past time. It is interesting to note that when, 90 or so years later, Peter Sutcliffe, the Yorkshire Ripper, was at large a similar type of “lark” became very much the vogue in offices throughout England. When John Humble, or “Wearside Jack” as he became known, sent in a tape purporting to come from the Yorkshire Ripper the police set up a hotline for people to phone in and listen to the tape in the hope that somebody would recognise the voice. It was quite common for people who worked in offices to dial the hotline and then divert the the call to the extension of one of their female colleagues as a “joke.” Certainly Miriam Howells’s actions were little different to this public reaction to a later murder sensation. At around the time that Maria Coroner and Miriam Howells were composing their prank missives, another anonymous correspondent was preparing to make good on a threat that had been contained in virtually all the letters received in early October, the threat to send a body part in the mail. The recipient of this missive was George Lusk, president of the Mile End Vigilance Committee, who had been extremely busy throughout early October. In addition to gathering information from local informants he was also addressing meetings and liaising with the press. He had also been badgering both the Home Office and Queen Victoria endeavouring to get them to offer a reward for information that might lead to the apprehension of the killer. His name was therefore, frequently being mentioned in the press and he soon attracted what would today be known as a stalker, possibly even two. On Thursday 4th October, at 4:15, a man apparently from 30 to 40 years of age, 5ft. 9in. in height, florid complexion, with bushy brown beard, whiskers and moustache, went to the private residence of Mr. Lusk in Alderney-street, Mile-end, and asked for him. “The stranger’s appearance however was so repulsive and forbidding that Mr. Lusk declined, but consented to hold a quiet conversation with him in the bar-parlour. The two were talking, when the stranger drew a pencil from his pocket and purposely dropped it over the side of the table saying, “Pick that up.” Just as Mr. Lusk turned to do so he noticed the stranger make a swift though silent movement of his right hand towards his side pocket, and seeing that he was detected assumed a nonchalant air, and asked to be directed to the nearest coffee and dining-rooms. Mr. George Lusk’s Vigilance activities had, it appears, made him a magnet for all manner sinister characters and sick individuals. On 10th October another suspicious looking man was seen lurking outside his house. This time Lusk reported him to the police and a description of him was circulated. I write you a letter in black ink, as I have no more of the right stuff. I think you are all asleep in Scotland-yard with your bloodhounds, as I will show you to-morrow night (Saturday). I am going to do a double Event, but not in Whitechapel. Got rather too warm there. Had to shift. No more till you hear me again. On 15th October a Miss Marsh was behind the counter in her father’s leather shop at 218 Jubilee Street, short distance from the London Hospital, when a man dressed like a cleric entered. He wanted to know about the Vigilance Committee’s reward poster in the shop window and asked if she knew the address of Mr. George Lusk. She suggested he enquire at the nearby Crown, but the man insisted he didn’t want to go to a pub. Obligingly she got out a newspaper that gave Lusk’s address, although not his house number, and read it out to the stranger who proceeded to take it down in a notebook. Miss Marsh described the man as being around 45 years old, six feet tall, of slim build with a sallow complexion, dark beard and moustache. He spoke with what she took to be an Irish brogue. No-one answering that description actually called on Lusk, but on the evening of Tuesday October 16th a small package, wrapped in brown paper and bearing an indistinct London postmark was delivered to Lusk in the evening mail. The handwriting was identical to that of the post card Lusk had received a few days before. Lusk’s first thought was that it was just another sick joke and he assumed the kidney to be from a sheep or some other animal. However, he decided to seek the opinions of his fellow Vigilance Committee members, and they were not so certain it was a joke. They, therefore, decided to seek a medical opinion as to whether the kidney was human or animal. It was duly taken to the Mile End Road surgery of Dr Frederick Wiles where, this doctor not being in, his assistant Dr Reed examined it and immediately pronounced it human. Reed then went for a second opinion and took it to the nearby London Hospital where he asked the Pathological Curator Dr Thomas Openshaw to examine the organ. The idea that the sending of the kidney was a prank perpetrated by a medical student appears to have struck the police from the outset. After Openshaw’s examination the organ was taken to Leman Street Police Station and then handed over to the City Police, in whose jurisdiction Catherine Eddowes had been murdered. Unfortunately no report from Sutton, if there ever was one, has survived, and it has to be said that Major Smith’s veracity has often been called into doubt. O have you seen the devle with his mikerscope and scalpul a-lookin at a kidney with a slide cocked up.